Last week psychological scientists from around the U.S. gathered in Washington, D.C. to discuss innovative behavioral research that will be used to save thousands of lives. Over 200 million Americans drive a car on any given day, and each year around 30,000 Americans lose their lives in car crashes. The National Highway Traffic Safety Administration (NHTSA) is one of the government agencies tasked with finding ways to keep drivers safe. The newest head of NHTSA, Administrator Mark Rosekind, is an accomplished psychological scientist recognized for his innovative research on human fatigue and performance. At the Transportation Research Board 95th Annual Meeting, psychological scientists from the NHTSA Office of Behavioral Safety Research presented on some of the group’s most promising new research. NHTSA research psychologist Amy Berning presented on the most recent findings from the National Roadside Survey, a completely voluntary, anonymous survey that gathers data from drivers throughout the United States. Drivers are alerted by multiple roadside signs that a voluntary survey site is ahead, and researchers gather data from those who pull over and volunteer to participate. For over 40 years, scientists at NHTSA have been refining the protocol for the study, which has allowed researchers to track trends in drivers’ drug and alcohol use in a naturalistic setting. “The best way to get drug and alcohol data from the road is to get the data from the road,” said Berning. In the most recent 2013-2014 National Roadside Survey, participants were recruited from 60 sites across the United States on both weekdays and weekends. 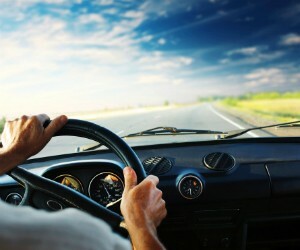 Researchers asked drivers if they would be willing to provide a breath test, an oral fluid sample, and a blood sample. A surprisingly high proportion of drivers agreed to provide samples — of 11,100 eligible drivers, 85% provided a breath sample and 42% provided a blood sample. Through this massive dataset, researchers have found that drunk driving prevention efforts seem to be working: Far fewer people are driving with blood alcohol concentrations above the legal limit today compared to previous decades. According to NHTSA’s roadside survey data, 7.5% of drivers in 1973 had a BAC above the legal limit. By 2014, the percentage of drivers over the legal limit had fallen to around 1.5%, representing an 80% reduction in the percentage of alcohol-impaired drivers on the road during weekend nights. On the other hand, the survey indicates that the prevalence of THC (the active chemical in cannabis) use has increased among drivers in recent years. Another worrying trend that NHTSA scientists are working to address is the epidemic of drowsy driving. According to NHTSA research psychologist James Higgins, around 850 fatalities, or 2.6% of all fatal crashes, were attributable to drowsy driving in 2014. Similar to the impairments observed in drunk drivers, research has found that fatigued drivers have impaired reaction times, decision making abilities, attention, and vigilance. But, unlike drunk driving, drowsy driving is difficult to measure: “There’s no roadside test for drowsiness, there’s no sleepalyzer,” Higgins explained. To combat drowsy driving, NHTSA is launching a National Drowsy Driving Plan, a new research initiative. This initiative will fund behavioral research programs that will investigate drowsy driving prevention, measurement, and policy initiatives to motivate widespread behavior change. Some of the countermeasures against road fatigue that researchers are currently exploring include new technologies that can monitor drivers in real time, alerting them when they show the telltale signs of tiredness. Studies are already looking into manually coded video data and facial recognition technology that can identify the behaviors that “tip off” signs of drowsiness. National Highway Traffic Safety Administration (2015). Results of the 2013–2014 National Roadside Survey of Alcohol and Drug Use by Drivers (DOT HS 812 118). Washington, D.C: U.S. G.P.O.